The Avengers is often called the best superhero film of all time, and it was certainly one of the biggest. That being said, Age of Ultron has some pretty big shoes to fill. It’s widely regarded as one of the most anticipated movies of 2015, second only to Star Wars. Does it live up to the hype? Sadly, no. Avengers: Age of Ultron is Marvel’s first big flop quality-wise. It’s a lackluster blockbuster, a sloppy mess of a movie that never should have been made. I’ve wasted 2 and ½ hours of my life to something that was utterly disappointing. I’m totally kidding. This is a freaking great movie and a fantastic addition to the Marvel Cinematic Universe. Set shortly after Captain America: The Winter Soldier, the story picks up with our favorite superheroes hunting down remnants of HYDRA. After Tony Stark and Bruce Banner start screwing around with artificial intelligence, the Avengers soon find themselves fighting for survival against an evil of their own making: the Ultron program. While it takes a significant departure in tone from the first Avengers flick, Age of Ultron delivers entertaining thrills and a level of depth that makes the Marvel Universe feel new again. It’s a worthy follow-up to its billion-dollar predecessor, even if it doesn’t hit all of its marks perfectly. I don’t need to tell you that everyone in this movie is great. We’ve seen them in action as the Avengers before. But this time around, their team dynamic is better than ever. The chemistry amongst the main cast of characters is just wonderful to watch. Not only are they enjoyable to see together on screen, they’re believable in almost every situation, which is saying a lot for a superhero film. When they’re bantering back and forth, it makes sense. When they’re at each other’s throats, it makes sense. And of course, I must give credit where credit is due. Director Joss Whedon knows how to bring these guys together, and he knows how to position them to bring us the best scenes possible. I was nervous about the introduction of Quicksilver and Scarlet Witch, especially since we’ve already been introduced to one of them in a completely different franchise, but they mix well with the rest of the team too. And finally making his on-screen debut in a Marvel movie is Paul Bettany as the Vision. We’ve heard his baritone in the films before as Tony Stark’s virtual butler, Jarvis, but this is his first time stepping out from behind the helmet. He too works well as the Vision, serving as another “good guy” type with a surprising amount of depth. 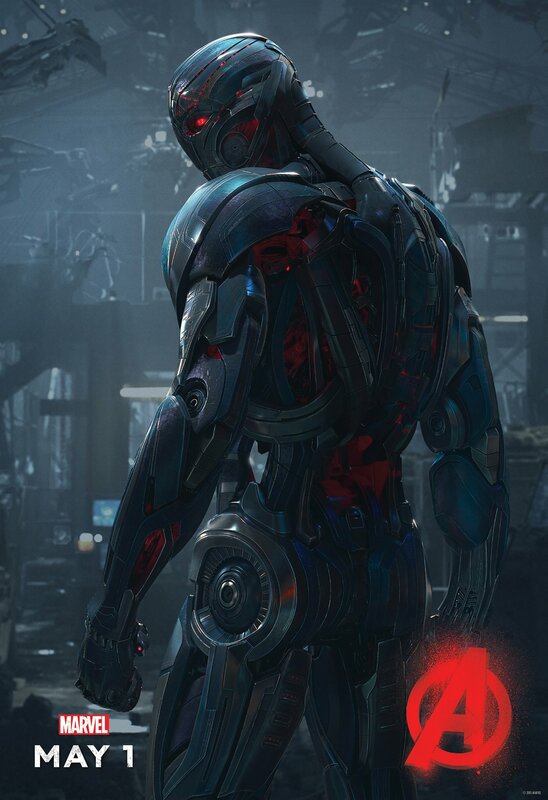 The most notable of the new characters is James Spader’s menacing robot, Ultron, who is without doubt the best Marvel villain from Phase Two. Whereas most of the Phase Two villains have been variations on the regal and bombastic maniac, Spader brings something to Ultron that has been missing from antagonists of the past: subtlety. It’s a brilliant duality that he brings by making the gigantic murder-bot the subtlest character in a superhero film. His vernacular and mannerisms are so lifelike that it makes him feel more human than one would expect. And to top it all off, he plays off the dynamic of the Avengers so well. Ultron was technically created by the Avengers. Because of this, his interactions with the group are more like those of an annoyed older sibling than an arch-nemesis. Spader is an extraordinarily talented actor, so it only makes sense that his portrayal of Ultron steals the show whenever he comes on screen. However, none of these characters would have meant anything if the movie didn’t set up a good tone. The thing that has becoming increasingly noticeable to me is how every Marvel movie feels right, in the way that each movie falls in line with its respective franchise. Thor: The Dark World felt like a sequel to Thor, Captain America: The Winter Soldier felt like a distinct sequel to The First Avenger, and following suite, Age of Ultron feels like a sequel to the first Avengers movie. That being said, this movie does a marvelous (ha) job at establishing an interesting tone: one that follows the spirit of the universe but still feels unique. There’s still a good mix of action and humor carried over from the first Avengers, but instead of simply rehashing the same themes, we’re taken deeper into the Marvel Cinematic Universe and deeper into the characters we’ve come to know and love. We get to see more of each character’s motivations and backstory, and we’re also treated to several new themes related to Marvel’s expansive universe. This movie is packed to brim with story and characters. In many situations, that can be a good thing. But in some parts of the movie, characters will go off on side quests that we don’t see much of, and therefore, I wasn’t really inclined to care about them. And with many subplots comes a greater chance for failure. One romantic subplot in particular felt a little bit forced and out of place. Some good things came from it, but it never really made sense character-wise. Because of it’s jam-packed nature, the plot also gets a little rickety halfway into the film. Things start moving very fast, and you wonder what on earth is really going on. With this style of storytelling, there’s just enough room left for some out-of-place editing. With Joss Whedon having already announced an extended edition of the Blu-Ray complete with alternate ending, the editing makes it easy to see the outlines of subplots that were cut for time. My final story-related complaint is that while I enjoyed all the hints at the future and all the setup for incoming Marvel movies, I do worry that it’ll set a dangerous precedent. Marvel Studios has stood out in their attempts at a Cinematic Universe because each adventure feels complete. If they try to stuff too many hints into one movie, it could feel a little bit disjointed. Other than that, the only thing that struck me as odd process-wise was the way Aaaron Taylor-Johnson and Elizabeth Olsen portrayed Quicksilver and Scarlet Witch respectively. I wasn’t a huge fan of their accents. I feel like if they spent a little more time on them, it could have turned out better. It just came across as a little wonky in the final product. There’s so much more I could say about this movie, but I guess you’ll just have to see it yourself. Instead, I’ll leave you with this: Marvel Studios has built upon their Avengers franchise for the better. Age of Ultron is a more than worthy follow-up to the original film, even if it’s not airtight in the story department. If you enjoy Marvel movies, you’re going to enjoy this one. It’s a great addition to the MCU with its newfound depth and character development, and it will be the movie to beat this summer. Let me know what you think of Avengers: Age of Ultron in the comments below!